Blueberry Honey is rich, buttery, and as sweet as a handful of summer berries. An ideal honey for tea, cooking, and sauces, it also makes a perfect glaze on chicken and fish. Enjoy this honey drizzled over baked goods and fruit. Pure, raw, and Star K Certified Kosher. Earn 18 Points when you purchase this item! If you wonder what makes our Blueberry Honey so sweet, it’s not by mixing blueberries with honey. Instead, the bees travel from blossom to blossom collecting nectar while at the same time passing and mingling pollen from bush to bush. The act of pollination makes honeybees important blueberry pollinators, increasing fruit yield by up to 1000 pounds per acre! Hives are typically stocked in commercial blueberry fields at rates of one to four hives per acre. What’s good for the honeybee is good for the fruit. 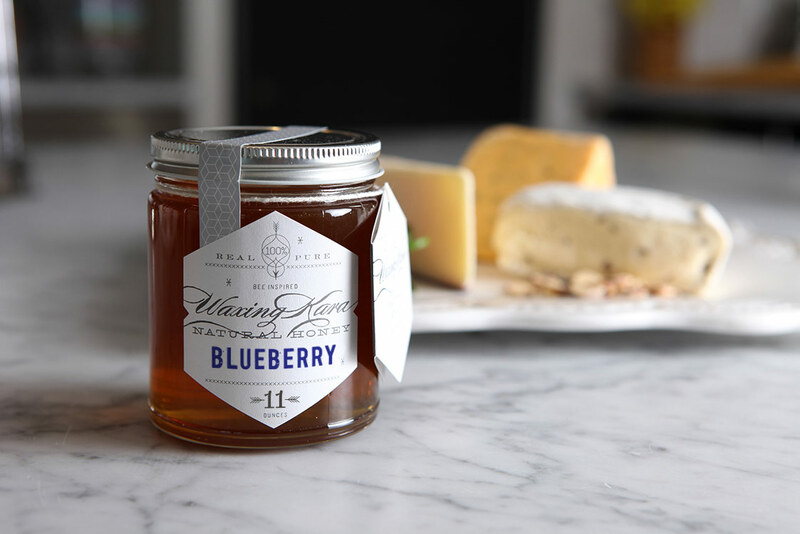 Our Blueberry Honey is thick and buttery, with a super-sweet flavor that reminds us of summertime. Raw, pure, and Star K Certified Kosher. Drizzle this honey over goat cheese and garnish with a fresh sprig of mint and raw walnuts and serve with sparkling wine. Blueberry honey perfectly complements Greek yogurt or muesli with berries and easily replaces maple syrup over hotcakes. Great in marinades and blueberry sauces for grilling fish and chicken. This honey is so versatile, it pairs well with tomatoes in soups and sauces. You can even make your own blueberry ketchup with it! Try it on watermelon with chopped mint, olive oil and feta cheese, in this Watermelon Feta Salad. I started beekeeping six years ago and covered all of the details in my blog and my YouTube channel. My mentor, Dale Large, a fifty-plus-year beekeeping veteran has taken the lead with my apiary and I am his devoted protégé. I am blessed and humbled by the amazing honey that the bees are making – from our farming efforts, and continue to expand to increase the amount of honey that I can offer from my own apiary on Chesterhaven Beach Farm. Like wine reflects the complexity of the soil and weather, honey tells the story of the hive surroundings in the same way. 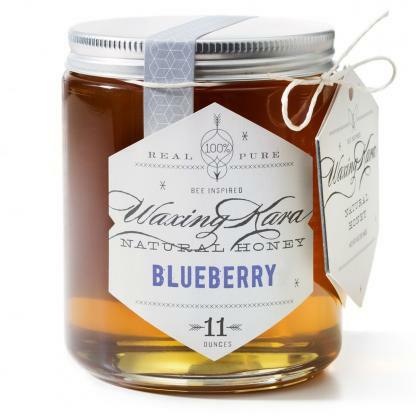 Our Waxing Kara® honey is nature’s blend from Chesterhaven Beach Farm. Each year, we add more plants and trees to support the bees. This is a years-long process, and each year the honey will be different. Varietal Honeys (made with nectar from one type of crop) are true labors of love by the beekeeper, who carefully sets hives in the center of cultivated fields for bees to provide pollination services just for the brief time of blossoming. Since bees will fly up to six miles to find nectar, the challenge in achieving varietal honey is to provide enough crops of one type to satisfy the hive. We don’t do any fancy blending, colorizing or infusing, nor do we pasteurize or boil honey. Pasteurization destroys all of the pollen, enzymes, propolis, vitamins, amino acids, antioxidants and minerals in honey. 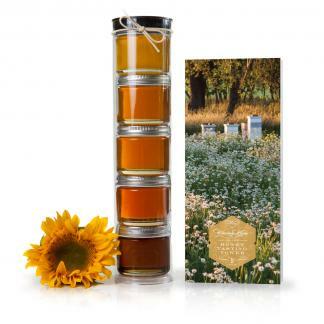 We sell only raw honey that’s been minimally filtered. We grow our own and buy from other small growers to keep pace with growing demand for honey in our region. We bottle, label and package by hand at our Honey House in Owings Mills, Maryland. Honey is a “perfect” food with an indefinite shelf life. Store in airtight glass, away from direct sunlight. Do not refrigerate. It’s not unusual for some honey to crystalize over time. It’s not a bad thing, it proves the honey is raw. If cloudy or crystallized honey doesn’t appeal to you, reconstitute by placing the glass jar in a pan of water that has been brought to a boil and removed from heat. 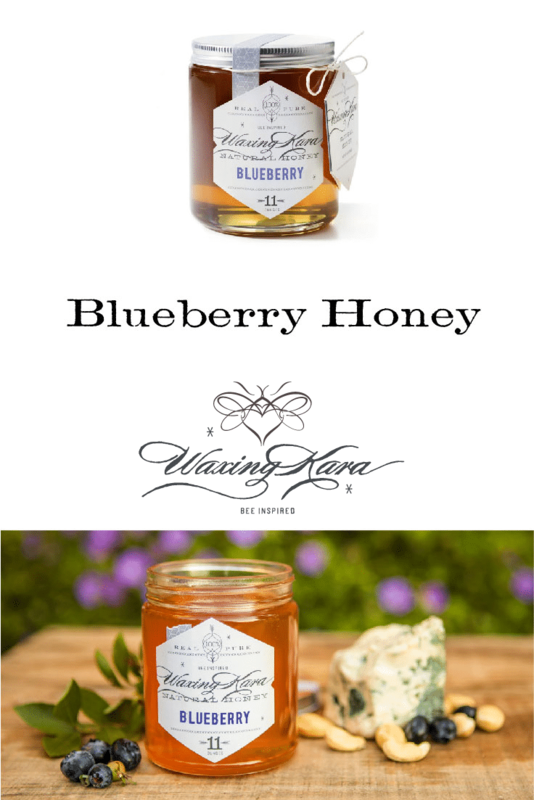 Love the blueberry honey…my personal fave…enjoy adding it to roasted cauliflower and brussel sprouts, delish! Just received blueberry and orange varietal and I have to say this is some very good honey. Love the elegant design which is one of the reasons I purchased from this company. It tells me that Waxing Kara puts tremendous amount of effort into producing a fine product. Will use mostly for Teas such as Earl Grey. My son loves it and I feel his immune system has become stronger after he started taking this honey. It’s a win win situation for both of us. The blueberry honey is my favorite. I have purchased it several times and keep going back to it. Local/regional honey supports health and immunity. So glad Waxing Kara takes the time and effort to provide such wonderful products. Thanks Lisa! We’re so happy the hear you are enjoying it.